Home/Office Technologies/Spring Cleaning – Retire Old Copiers and Printers! Do you have old copiers and printers collecting dust and taking up space in your office? Retiring old devices and replacing them with new multi-function printers not only frees up extra space in the office but it can also improve your document workflow. Cornerstone Technologies will help retire old equipment and can setup a new replacement that is more effective for performing the daily document tasks your office requires. 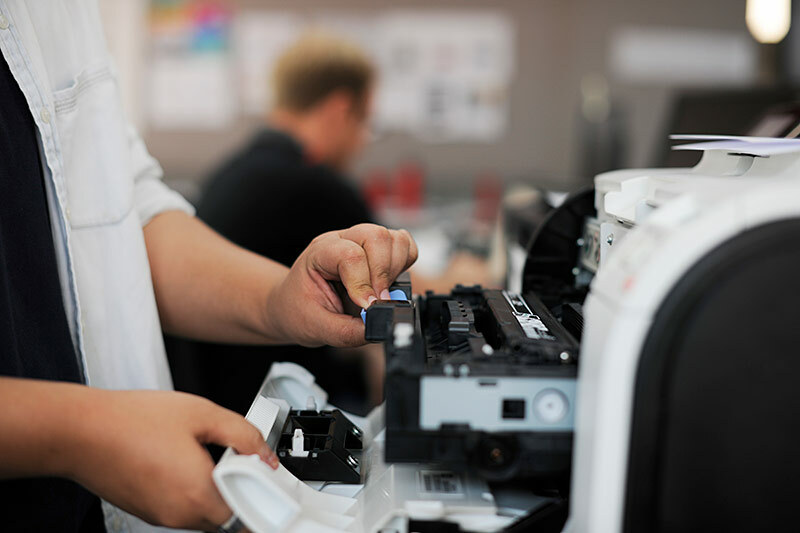 Maintenance plans with replacement equipment can be customized to fit your printing and copying needs in order to centralize your workflow and save on extra printing costs. Equipment that is 8, 9, even 10 years old typically is not networked and does not have the function of scanning, faxing, and printing. Do you have other technology devices that are 10 years old in your office? You will be surprised of all the connection possibilities that new machine have. You could be allocating funds in the wrong place. Sometimes they can carry expensive maintenance contracts that overtime are not being fully used–it is like paying for 1000 cell phone minutes and only using 20 minutes a month. Power consumption is lowered on new devices cutting your electricity bill and saving the planet’s resources. Slow printing speeds are not the only thing you will improve with new equipment. Having a maintenance plan with Cornerstone will also free up invaluable employee time so that they are not working on equipment–the equipment just works. Old devices typically had one function: make copies or just print. New devices are all in one printers, scanners, copiers, and fax.